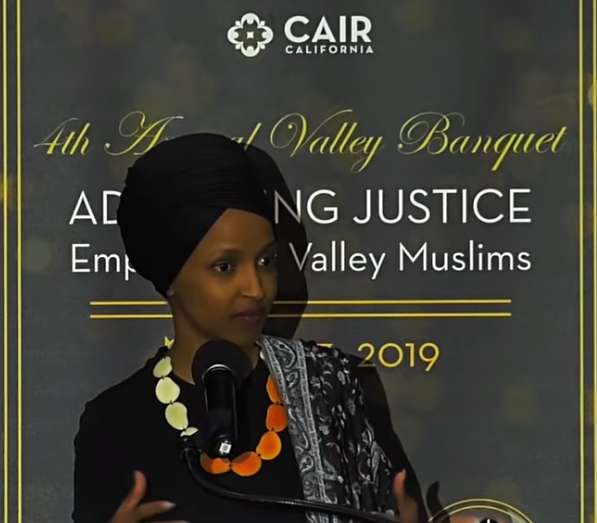 Congresswoman Ilhan Omar’s now infamous speech at a Hamas-linked Council on American Islamic Relations (CAIR) event March 23, 2019, was ostensibly about “justice” in Islam. Indeed Ms. Omar, acknowledging that although she wasn’t a hafiz (i.e., an extremely devout Muslim who memorizes the entire Koran; female=“hafiza”), nevertheless riveted her discussion on Koran 4:135. This verse highlights the supremacy of Islam in deciding what is “just”—namely, following the dictates of Allah, exclusively. The intimately related following verses, 4:136, and, especially 4:137, make plain those also provided Islam’s message via Muhammad, who chose to reject it—Jews and Christians—will not be guided, and more ominously, not forgiven, this “transgression.” (for confirmation, see these authoritative Koranic commentaries, here, here, on Koran 4:137). was founded after 9/11/2001 [note: CAIR was founded in 1994, as a Hamas affiliate] because they recognized that some people did something, and [Muslims] were starting to lose access to our civil liberties. Amidst the cacophony of well-deserved denunciations leveled at the good Congresswoman for her insensitivity, it is worth asking exactly whom she considers the “some people” that “did something.” This question must be posed to her directly. Why? As Pew polling data have revealed, consistently less than 30% of Ilhan Omar’s co-religionists, Arab and non-Arab Muslims alike, from a “high” of 28% of Lebanese Muslims, to only, 9%, 12%, and 20% of Muslims from Turkey, Pakistan, and Indonesia, respectively, believe that Arab Muslims were responsible for the 9/11/2001 jihad carnage. Not surprisingly, in light of the ongoing global pandemic of conspiratorial Muslim Jew-hatred, the notion that 9/11 was a “Zionist/Jewish” conspiracy has flourished across Islamdom, promoted by institutional Islam, including within the U.S. Since its founding in 973 C.E., Al Azhar University (and its mosque) have represented a pinnacle of Islamic religious education, which evolved into the de facto Vatican of Sunni Islam. Egyptian Sheikh Muhammad Al-Gamei’a, the Al-Azhar University representative in the U.S., and Imam of the Islamic Cultural Center and Mosque of New York City, at the time of the 9/11 attacks, provided a very concrete and disturbing example of the authoritative Al-Azhar Islamic mindset exported to America. Sheikh Gamei’a was interviewed for an Al-Azhar University website, on October 4, 2001. Sheikh Gamei’a returned to Egypt after September 11, 2001 alleging, without any substantiation, that he was being “harassed.” Gamei’a’s interview (original Arabic; extracts translated here) was rife with conspiratorial Islamic antisemitism, based upon his invocation of the central Koranic motifs of Jew-hatred, while equating Jews and Zionists. His “conclusion”—rooted in Islam—was that the Jews “plotted and planned” 9/11. The Jewish element is as Allah described it when he said: “They disseminate corruption in the land.” [Koran 5:32–33; 5:64] We know that they have always broken agreements [4:155; 5:13], unjustly murdered the prophets [Koran 2:61; 2:87; 2:91; 3:112; 4:155], and betrayed the faith [2:42; 2:75; 2:89]. Can they be expected to live up to their contracts with us? These people murdered the prophets; do you think they will stop spilling our blood? No. You see these people (i.e. the Jews) all the time, everywhere, disseminating corruption, heresy, homosexuality, alcoholism, and drugs. [Because of them] there are strip clubs, homosexuals, and lesbians everywhere. They do this to impose their hegemony and colonialism on the world. Now, they are riding on the back of the world powers. These people always seek out the superpower of the generation and develop coexistence with it. Before this, they rode on the back of England and on the back of the French empire. After that, they rode on the back of Germany. But Hitler annihilated them because they betrayed him and violated their contract with him. We saw these Zionists, just one hour after the event [the 9/11 attacks], broadcasting on the BBC, the biggest media channel, that the Arabs, and particularly the Palestinians, were celebrating and rejoicing over the American deaths. [which in fact was true; see video]… This is what the Jews plotted and planned. They used the Arabs to carry it out. All the signs indicate that the Jews have the most to gain from an explosion like that. They are the only ones capable of planning such acts. Given Ilhan Omar’s own conspiratorial Jew-hatred, does she believe “Zionists”/”Jews” were ultimately responsible for 9/11, even if she concedes “hapless” Arab Muslims—per Al-Azhar’s 9/11-era U.S. representative Sheikh Gamei’a—were somehow “manipulated” into carrying out the mass murdering attack? Inquiring journalists should demand she provide a clear explanation of her views on whom she holds responsible for 9/11.